Every Saturday morning at Bloor Street United Church (BSUC), a tapestry depicting the Ten Commandments is hung in front of the giant cross. It’s a sign that for the morning, the church has been transformed into a synagogue for the hundreds of Jewish congregants who observe Saturday services at the City Shul. “We had to figure out a way to cover up the cross, which was quite large. We had to find a way to repaint our Jewish identity in a Christian space,” said Rabbi Elyse Goldstein, who founded the Reform synagogue in 2012 at the urging of former students from Kolel Adult Education Centre for Jewish Learning. 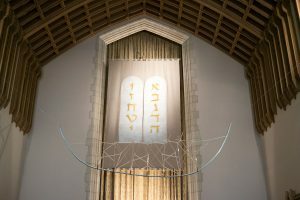 The synagogue’s first home was at the Wolfond Centre of Jewish Campus Life at the University of Toronto, but the congregation outgrew the space — which can hold only 60 people — in five years. That’s when the BSUC came in. 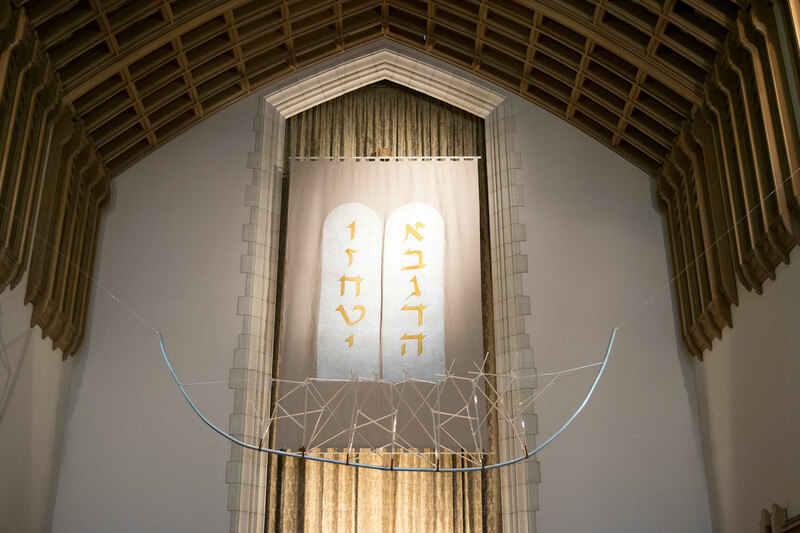 City Shul had been holding its High Holiday services at Trinity-St. Paul’s United Church, but needed an alternative space in 2013, when Trinity-St. Paul’s was undergoing renovations. “So [City Shul] came to us looking for short-term rental just for a couple of weekends in the fall,” said Reverend Martha ter Kuile of BSUC. As the relationship grew over the years, ter Kuile said that representatives from the congregations met over several months to consider whether City Shul should make the move permanent. “Bloor Street United was very, very open and warm and interested in how they can accommodate us,” added Goldstein. It’s not the first time that Bloor Street United has shared its space with another congregation. It was initially a Presbyterian congregation that voted to enter the United Church of Canada in 1924. The Alpha Korean United Church was a tenant of BSUC for 50 years until it moved to Willowdale last year, coinciding with City Shul’s relocation in September. Mary-Louise Work, communications director for BSUC, described having City Shul under the same roof as a “very positive experience”. “Co-locating with a Christian church speaks to a certain intention that’s really powerful and important to us,” said a member of City Shul. “We care about pluralism, we care about living in the community. We care about being friends and good neighbours with people of other religious communities. Both congregations believe in inclusivity, diversity, and plurality. Ter Kuile said that “sincere worshippers should have a place of worship” when describing City Shul’s similarities with her congregation. City Shul has moved in just as plans are being made to renovate the church, but Goldstein said that will not have an impact on the congregation. Both City Shul and Bloor Street United will simply move to another location until the construction is complete. Rabbi Goldstein and Reverend ter Kuile will lead a shared Sabbath dinner at the end of the month with members of their respective congregations to learn from one another’s faith. Goldstein believes that BSUC is a perfect match for City Shul. She and ter Kuile want to work together with the community to make the church open to all faiths for the foreseeable future. “We are discussing with the church ways that physically the church can be more of a dual-purpose building,” Goldstein said. “I think the goal is for us and the church to stay together as a dual-purpose building.